This was our final class and each group was giving their presentation today. I was feel nervous before class so I wrote out the points I would be discussing on flashcards to help me throughout the presentation. Half an hour before class started there was some confusion about who was doing what. Ciara noticed there was some texted added to her part in the google docs page. We didn’t know who added it until Eva said in the messenger group chat that it was her. I was getting pretty stressed out because we should have had everything ready for the presentation and having to change things around 30 mins before class didn’t help with my nerves. Once we got everything sorted about I logged into second life. There was a few people already waiting in class so I sat beside Assesi so our group was sitting together. John arrived and needed to help some other teams to upload their presentations into second life. He also asked everyone where they there presenting with only one team going to a different location. There was a guest this week, Locks Aichi. She used to teach in Second Life with John but now she works in PayPal. She helped give some feedback on each of the presentations. The Blue team were the first to present. They did their presentation through the form of a video. This was a good start to the presentations, I liked some of the points they were making and they did it in a humorous way. The only problem that John seemed to have with their presentation was that they didn’t credit the sources where they got their images and music from. The Group was the Green team. This team all had the same costumes on which I thought was a great idea. The read team presented a video which included the voice of each member of the team so I thought that made it a bit more personal which was nice. Our team presented after the Red Team. We went downstairs in second life and I began to feel really nervous. I normally get nervous doing presentations in class but I thought in second life it would be easier since it is a virtual classroom where I can’t really see anyone and they can’t see me but I was wrong. Assesi started with the introduction and asked everyone to watch a video before we started. This was a video that Assesi has shown to us last week and we thought it would be good to use in our presentation. We were right, it seemed to go down a hit! 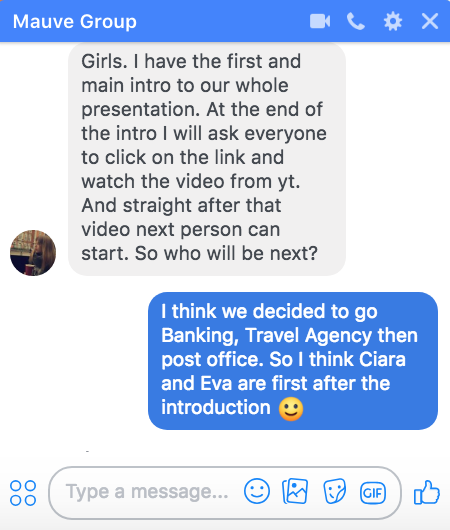 After the video Ciara talked about the future of banking and the pros that come with this. I talked about the future of travel agencies and the pros that come with this and Princess discussed the post office future and the pros of this. 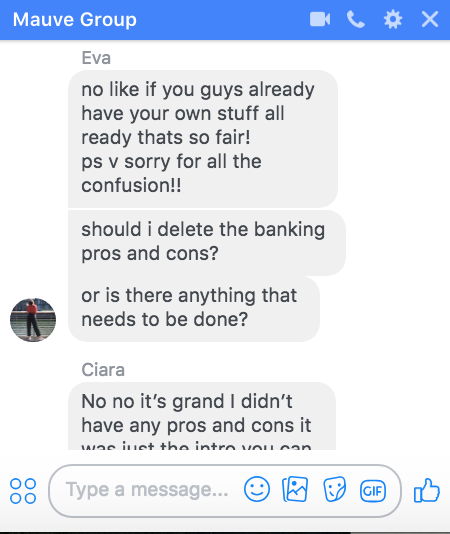 We told Eva in messenger before class that she could read the cons because she hadn’t come to any of the group meetings and therefore didn’t have anything for her to do as all the topics where already given to everyone else in the team. So Eva read the Cons of each business that we discussed. Zoe then finished with the conclusion. In the beginning of our presentation Zoe was logged out of Second Life unexpectedly. She thought she might not be able to log back in and so one of us would have had to read her conclusion but she was able to log back in just in time to do her conclusion. Thankfully each member of the team put their points up on the google slides doc so if Zoe was not able to log back in, at least one of us would have been able to take her place. I think the presentation went well and our group came across as organised. To complete this project we used a few tools being messenger, Second Life, Google Slides and Google Doc. When other teams were asked what tools they used, majority of teams had met in person which I thought was interesting. In my experience I thought it was interesting to have a group project where we only met online. The best was saved for last. The Yellow group were the last to present and they asked us all to teleport to a different location. We all clicked the link and the whole class teleported there at the same time. Once we arrived the owner of a shop got very upset and began using strong language and clearly wanted up to leave. I didn’t know what was happening and we all teleported back to DIT. I know the woman was upset but I thought the whole situation was hilarious. It was the best part of the night for me. It was just so unexpected and will hopefully go down in the Virtual Environments module history. Everyone in the class teleport to the location. A lot of loose body parts! I stayed until the end of class which finished up at nearly 10pm! Thankfully I was already in my pyjamas and was able to deliver my presentation from the comfort of my bed. I have thoroughly enjoyed this module and would recommend it to anyone. It was been a really nice experience and really different to going to a class in the real world. The next day I logged back in to Second Life because I wanted to teleport back to the location we had attempted to go to last night. I was the only person there when I went (Thankfully) and I was able to walk around, see what was in the shops. It was decorated for christmas with christmas trees up and there was music playing. There was some giant cats walking around so I interacted with them and got some profile pic worthy snapshots. It turns out that the woman who owns the shop (the woman who got upset with us the night before) it a crazy cat lady. No seriously… It says it on her shop wall. It seems that she has definitely but a lot of work into this place and I understand that if there was people trying to buy things in the shop on a normal day and suddenly 30 people appear at the same time why she would be upset. But I still think it was a funny experience. This week we talked about the presentation that is due next week. I found this class really helpful as I was curious about different options that we had to deliver the presentation. In Second Life you are able to upload images but you need money. The currency is called Linden dollars and it “can be used to buy, sell, rent or trade land, goods and services. Goods include cars, clothing, jewellery and buildings. Services include entertainment, camping and wage labor. Linden dollars fluctuate in value against the U.S. dollar. Linden dollars can be bought using U.S. dollars and certain other currencies on the exchange service provided by Linden Lab.” I looked up Linden dollars to get the correct spelling and got sucked into a forum about ways to make money in SL. There was a funny post about how a quick way to make money is to select a female avatar and become a stripper which I thought was very funny. Apparently by making money in SL, it can be changed into money in real life. I thought it was interesting that people are considering having a job in an online game and use the money to pay for things IRL. Second Life seems to have it’s very own economy which is something I hadn’t really thought about. John said that we have two blog posts left to do. This blog post should include information about how me and my group have prepared for the presentation. The final blog post next week should then be reflecting on the presentation and how I feel it went. In class we talked about how the presentations should be given. They should be more visuals than text if you your group is doing a powerpoint (which our group is). Being verbal is more important, the slides are just a support. If there was a lot of text on the slides and you were just reading from the slides, it would not be engaging or entertaining for the audience. We discussed the ways to present a powerpoint in SL. John suggested either bringing the slides in as images, but they would need to be saved as jpgs or to use a site called Slide Share which would allow everyone in class to open and view the presentation at the same time while we talk about it through our avatars in Second Life. Some people in the class are looking into different locations in SL to give their presentation. John said to be careful when looking for locations because some don’t allow you to use voice, this doesn’t apply to our group because we weren’t looking into a different location but I still thought it was interesting. I had just assumed you could use your voice anywhere in Second Life. For the rest of the class John asked us to come downstairs. John was offering to answer any questions that people had about the presentation but I think no one wanted to be the first person to speak out. John was able to build a block and then to change the shape to create a flat board. He suggested using this as a screen for the presentation and placing images on to it. When you import images into Second Life they will go into your inventory. My inventory can be accessed by selecting the ‘Me’ tap in the tool bar at the top of the page Me>Inventory. I haven’t looked through my inventory since week One when I went to Flotsam Beach and received a free map so I knew I had an inventory but wasn’t aware of everything that was in it. I tried placing an image from my inventory onto the object John had made but it seemed to be locked and I was unable to place an image on it. John thought people were unable to place images because some people where not part of the module group. I had already accepted the invitation and was still unable to edit the object. Someone in the class, I think it was Ruifeng built an object and I was able to places images onto this object. So I think the issue was just with John’s object, he might have had the actual object locked so no one could edit it. John talking about how we could use these board in your presentation. Image shows John’s Board and Cube created by other student with an image I placed on to it. John then gave money to groups who wanted to upload images for their presentation, so Ciara got money for our group. Next week the order of the groups giving presentations is Red, Green, Blue, Mauve and yellow. So my group will be going second last. I would have preferred to have gone early on to get it out of the way but I am looking forward to seeing how other groups approached the brief and how they will present their information. For the presentation we are not graded as a group, we are graded as individuals. I think I have enough research done on my top and am preparing what I am going to say for the presentation but I’m also afraid that I will get nervous. I get nervous doing presentations in class so I don’t know how I am going to react to doing a presentation in a virtual classroom. As a group we decided that uploading our presentation to Slide Share would be the best option. We currently have our presentation in Google Drive so in order for everyone to view it, we would have to share it with the each student in the class so by uploading it to Slide Share will make things easier for us. I suggested that since we have three topics that we’re discussing, it might be a good idea to have three images imported into second life. One relating to Banks, Post and Travel Agencies. I think this will be a way of helping the audience to visualise what we will be talking about. Eva hasn’t been to any of the group meetings and I don’t think she has seen our messages in the group chat. I don’t know if she is coming the the final presentation but if she it will be hard to give her slides to talk about when she might not even know what we are talking about. We talked about this when we met in a group after class and said we would go ahead with the presentation the way it is and if Eva shows up we’ll deal with it on the day by trying to give her 2 slides to talk about. We decided that we would meet up on Tuesday and go through the presentation. I hope that meeting goes well and everyone in the group knows what they are going to say. Then we can know when the person before you is finishing and there will be a smooth flow through each member of the group when giving our presentation. This week we had a guest lecturer Glenn Loughran (avatar name – feilimy) who is teaching on the BA in Visual Art on Sherkin Island. Glenn showed us a picture on the wall of our class room which is actually an image painted by one of the Sherkin Island students last year. The image was a response to the space in the context of Sherkin Island. We first talked about the general story. When I read to text, I found it hard to understand and didn’t really understand the story that was being told. Moral theory pins the first half of the story , is it right to have happiness at the many for the expense of the few? The people in the text are happy, intelligent, complex people, meaning they have a complete understanding of everything they’re doing. But there is a turning point in the story where everything goes from a Utopia to a Dystopia. There is a child that is kept in bad condition in a room, the child is visited and looked upon but the situation never changes. People are dismissive but knowledgeable of it. The can benefit from the child suffering and the happiness in the community depends on the child suffering. So would anyone stand up for what’s right or just walk away? This story could be used as an example of how the world is today. It conveys the topic that could relate to alienated labour. Everyone knows it is wrong but just accepts it as the norm. Utopia is crammed with the idea of technology . Could we be happy without it? Is it something we can escape? Would it be bad to give up? Personally, I think that we could be really happy without technology but people are just addicted and feel they couldn’t live without it. I think it’s like a smoker. You know it’s bad for you yet you can’t seem to give it up. But once you do, you see all the benefits it has and you’ll be able to take a deep breath of fresh air. In term of our project, as an individual, what is our responsibility? What would you do with the child? Ignore? It is about awareness and personal responsibly and this should be thought about when preparing our presentation for our group project. Our group was meant to meet up after class today. I was sitting on my own after class for a few mins and was afraid no one else in the group was going to come. I sent a message into our group chat to try suss out the situation. OPrincess then appeared into the room and we waited for others. Ciara said she’d be online in 5 mins, Zoe’s computer crashed and couldn’t make it, Assesi was confused about whether we were meeting in SL or Google slides. I said that I thought it would be easier to discuss things in SL using our voices. I really don’t want to be a leader in the group or sound like I’m bossing people around but no one else seems to be taking charge so I just kind of fell into the slot of a head person in the group. I’m always asking if we’re meeting up, at every meeting and trying to move things along quickly. We’ve had a couple of weeks to do this and I feel like we haven’t really got anywhere which is frustrating. So after OPrincess, Ciara, Assessi and myself were online we began to discuss the project. I suggested giving each person a role so that each person will (hopefully) contribute to the presentation and also so each person could talk about their role in within the group. We also talked about the tools we used throughout the project (Second Life, Messenger and googleslides) and I think we could link this to the presentation. We were only allowed communicate with each other using technology and this is what we’re suggesting the future of business will be like in the future, so we could talk about our experience. We looked at the google slides document and divided up the slides so each person could have 2-3 slides. Assesi said she would do the introduction, Ciara said she’d like to do banking and Princess said she’d like to do the Post Office. I was hoping to be able to do one of the careers I suggested because I had a lot of ideas around them and would have been comfortable talking about them but the only one left was the travel agency which was Assesi’s suggestion. But I am looking forward to doing research into it and presenting it to the class. Zoe couldn’t make it to the class so I sent a message into the group chat telling Zoe what we decided so that she wasn’t out of the loop. Eva hasn’t been to class regularly and hadn’t been to any of our group meetings so I wasn’t sure if she was even doing the presentation. I saw her in college the following day and talked to her for a few mins to update her on what we were doing. I know we’re not meant to meet up offline but I didn’t want her to come to the presentation and be thrown in the deep end. So we should be meeting up after class next week to make some final decisions. We said for next week we would source images and quotes that we could use in our presentation. Ciara also suggested dressing our avatars up in an outfit that looks like the uniform of the business each of us will be talking about which I thought was a good idea. I added text to my slides in the presentation during the week but I don’t think anyone else has. I still need to find some quotes to back up my points and source images. I hope the meeting goes ahead after class because this is our last class before the presentation. This week we started the class talking about the texts we had to read from last week. We talked about the slides that discussed the idea of the Consumer also being the producer – being described as a Prosumer and Produser. Users can now edit and add to content online which makes the user also the producer. We talked about how we get information. Today we get information from TV, online, radio and libraries. But before we had all this available to us, the only real source of information was Encyclopaedias. Unlike getting information online, encyclopaedias are fixed, you can’t change the information once it has been printed. Encyclopaedias are time-bound but with a website like Wikipedia we all have an opportunity to contribute and it will be more up-to-date. The information on Wikipedia is not always reliable as it could be anyone adding information or editing the site. Encyclopaedias are reliable sources of information even though they are time-bound. There are more gate-keepers before information becomes public when producing encyclopaedias. I went onto a Wikipedia page and tried to add a sentence that didn’t really relate to the page. I was unsuccessful in my attempt- receiving a message from wikipedia. As a Produser, you need to be aware of what you are putting up online. It is publicly available for anyone to see. Some websites, such as Wikipedia are able to monitor what is being added to pages which is good, but I’m sure there is still some things that slip through and can make it onto the website even if they are untrue. My group was meant to meet after class this week, so I put a message into our group chat on Facebook before class started to make sure we were still meeting up but Assessi wasn’t going to be able to make it so we decided to meet Monday night instead. Monday night came, I received a message from Zoe who said she was the only one in Second Life. I had completely forgotten and logged into SL as quickly as possible. I put a message into our group chat asking if the meeting had already happened. It seemed that everyone had forgotten about it so I joined Zoe in Second Life and then OPrincess. We waited for more member of our group. Assessi then said her laptop was broken and asked if we could talk in the group chat instead. We talked about each other’s suggestions and the group actually liked 2 of my ideas. We were trying to think about careers and professions that have or will change drastically in the future. One of my suggestions was to talk about Banks. I think eventually there will be a fade of physical money and everything will be paid electronically. Online banking has become so popular that hardly anyone needs to visit the bank anymore, and even if you do- most things can be done using a Kiosk. Most people don’t carry cash anymore and a lot of shops prefer electronic payment. You can even pay using your phone and smartwatch now! As Zoe put it “No physical money, no paper, no worries”. My second suggestion was the postal service. Advances in technology has cut out the need to use the postal service. Messages can be sent instantly via social media or email. It is also more reliable as letters can sometimes be lost in the post. Paying bills is also easier online and it would be cheaper as you don’t need to buy stamps or envelopes which is also benefiting the environment. Assesi’s suggestion was Travel agencies, which I thought was a good one. We talked about how people can book their holidays online now rather than having to go into a travel agencies. You can see reviews of hotels online and make educated decisions about where is the best place to stay. Myself, Zoe, Ciara, OPrincess and Assessi were all throwing out ideas, pros & cons to each and I think we will actually have a lot to talk about in your presentation and I’m happy that we are actually identifying our topics that we are going to be discussing. We said we would be after class in week 9 to talk more about it so I hope that goes ahead and that we can actually designate roles for each person in the group. This week we started by talking about the blogs again. We discussed the assessment criteria, writing styles and that your blog needs to be somewhat academic. From having this discussion in class, I’ve realised my blog needs more references, images from other sources and I need to focus on writing about the topic we are asked to write about that week. John said that we should approach the module as an interesting learning activity, taking what you learn and apply it to the future. I think this can also be applied to the brief, we are learning a lot about the pros and cons of everything being online and the brief is asking us to look at jobs and how the have/will change in the future. I believe that everything is going to be online and there will be no need for many facilities that we have now. So we can take what we are learning from the module, the pros and cons, and use these to assess jobs now and how we expect them to be in the future. This week we are asked to write an update on the progress (or lack thereof) our team is making with the group project. Our group has not met since week 4. Our group was meant to stay back after class this week but only myself and one other member were in class this week from what I could see so the meeting did not happen. The next day Assesi asked for our emails so that she could set up a google slides document, later that night I got an invitation via email to join a google slides document. There was a slide for us to put down our two suggestions of jobs that have or will change drastically in the future. Assesi had her two suggestions up already which were Librarians and Travel agencies which were actually two sectors I wouldn’t have thought of. It is good that we have our google slides document set up now so once we decide in the direction we want to go in, it will be easy to work our work together. I am frustrated and feel under pressure because we haven’t even got past the first step according to Diogo Costa… I am hoping that we will meet after class and Identify the project goals fully, Decide on tasks for each person and be able to get a lot done for week nine. I am excited about getting into this project and having the opportunity to get creative by thinking about the possible outcomes of different industries in the future. With advancements in technology it can make almost anything possible. This week John started by talking about our blogs. He gave us some overall feedback, saying they need to be more reflective, comparative and reflect on team work. We should be looking at our blogs from an outsider perspective to asses whether they still make sense and are easy to follow. Through John discussing this, I think I defiantly need to spend more time focusing on the the team work, team dynamic, how it is working and why and reflect on what I am learning. Everything that we post, share, say, upload, snap, and tweet represents our digital identity. Unlike one-on-one face-to-face conversations that reside in our memories once concluded, digital communications have an almost eternal shelf life. This is a really interesting way of putting it. We talked in class about over the past decade it has become really hard to keep anonymity online. Prior to the digital age, our identity, style, beliefs and values were mainly revealed by our material possessions. But now I think it is fair to say that our “web searches and web page visits, emails and social networking activity contain traces of our personality.” Which is a scary thought because nothing is private and we have no control over where the information and data goes. The Question was raised in class, Does having an online presence effect your team work? The group that I am in, I know four of the five other people in the real world so I don’t think I could answer this question fully. The one person in my group, Assesi, I don’t know outside of our online interactions. We became friends on Facebook so that we could create a group chat but I could pass her in the street or sit beside her in the library and not even know that we are working together on a project which is really interesting. It raises the concept of having two identities, one for online and one for real life. This could even be fragmented further and we could say we have different personalities for different situations. We may be different in college to how we are at home and different in work to how we act around our friends. Are these just masks that we put on or do they all make up the core of yourself. Over the week I was thinking about jobs that may cease to exist in the future or jobs that have changed drastically in the past few years. One of my first thoughts was Design and how technology has advanced so much that anyone with the adobe suite could give it a go. “Software and technology allow designers to quickly and easily bypass processes that once took hours, enabling them to focus on other key areas such as creativity and innovation.” Technology is a tool that has helped speed up the design process, work can be easily mass-produced and made design look clean. Another sector I was thinking about was banks. For another module I am creating a new currency and it got me thinking about how physical money will eventually fade out and everything will be electronic. Again this is due to the advancement in technology, online banking and credit cards. We can already see this coming into play in certain sectors, for example Dublin bus. They are trying to encourage people to use Leap Cards through not giving change for overpaid fares. Eventually you won’t be able to pay using coins, it will all be with cards. They are also trying to get rid of the 1 and 2 cents meaning your change will round to the nearest 5c unless paying with card. But as a cashier in a supermarket I can tell you first hand there are people (particularly elderly woman) who are unhappy about this demand their 1 cent. Then maybe there will be no need for bankers, all transactions can be done online and nearly everything else can be done using a kiosk in the bank. I don’t think the complete fade out of physical money will happen in my lifetime but maybe within the next 100-150 years. The third suggestion I was going to put forward to my group was the postal service- An post. The main channel of communication used to be through post but now thanks to advances in technology people don’t really rely on this system anymore. They can now just send an instant message or call the person they want to talk to . This saves time and paper but can also mean that someone texting you isn’t as personal as receiving a letter from someone. I am going to do some research into these topics and link them back to the brief and then put my points forward to my group when we meet up. All these three points have the same principle of advances in technology and a more efficient and eco-friendly way of working. Only one of them is in a creative field but I don’t think it matters for this project. I’m looking forward to meeting with my group and hearing other peoples suggestions and finally getting a plan in place so we can get the ball rolling. During the week John posted in our Facebook page for Second Life trying to get a poll to see how many people could attend class on Wednesday instead of Thursday this week. This suited me, but there was a lot missing from the class this week so clearly the change didn’t suit a lot of people in the class. We talked about the brief during the class which was good because I was still completely confused about it. Other people in the class seemed to be confused too so John tried to sum up the brief. We should consider what the future of work is going to be in our lifetime, facing the exhaustion of a lot of resources we rely on and how a lot of jobs people do now will eventually become extinct. After the brief was explained I thought it was a really interested brief and was excited to do more research. John began to talk about the reading from last week. It really felt like he was trying to squeeze blood out of a turnip this week. John was trying to get us to discuss tools and what impact they have on people and society but we weren’t exactly hitting the nail on the head, excuse the pun. I think this made the class really long and I began to loose interest, zoning out at times. This was the first time I had felt like this in the module, I think it was just a lot of information to take in at once. It did make sense in the end though and was quite interesting. We talked about the power of the tool and how it can shape the world around you. John said as well as being a cure, the tool can be a disease, we talked about how when holding a tool it can become part of you. We also discussed how we take in information and things that help deliver information to us. We used photographs as an example and explored the differences between photographs and paintings and if they both captured the same scene what information both can give us and why would it be different. We then talked about the reliability of information today vs. when 1930’s when everything was believed. This brought us into virtual vs reality and the differences there. After discussing the brief through the class I was thinking about the project and I’m not sure if the travel blogger would be a good example to choose. I’m just having a hard time trying to fit it into the brief. We didn’t meet as a group in SL this week, no one mentioned anything about meeting up and to be honestly I completely forgot. 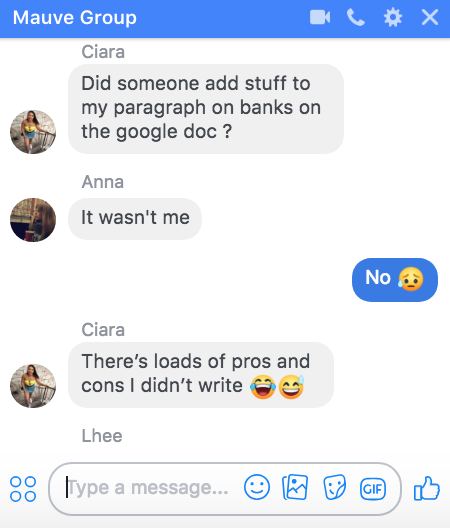 But Anna put a message into our Facebook group chat and we discussed the brief. Anna put forward 2 suggestions, one- that we each pick a profession that we would like to do in the future and analyse it how it has changed during the last few years. The second suggestions was that we would think about profession which used to be important but today they are not needed as much, why this change happened and if there is any way of bringing it back. I think these are both good ideas and I can definitely understand how they link back to the brief. The problem with the first suggestion was that I think it would feel like we would all be giving separate presentations within the same group which would defeat the purpose of a group project. “dividing up the work too much can mean students aren’t really working together as groups“. At the stage, our group has past the ‘form’ stage. We all know each other and have a group chat set up although we don’t know much about each other. We are now in the ‘Storm’ stage where we are trying to figure out the brief and deciding what we are going to do. Our next group meeting will be after class in week 7 as I don’t think any of us are available to meet next week. . We decided to each choose 2 professions that used to be important that are now starting to fade out or have changed drastically and why. I will research this and present my my 2 suggestions to our group when we meet up and we will have a vote on which professions we want to discuss in our project. We should then enter the ‘Norm’ stage and be able to have a goal and a mutual plan set in place. We will hopefully set roles and tasks for each person in the group, I think this would divide the work and make everything run smoothly.